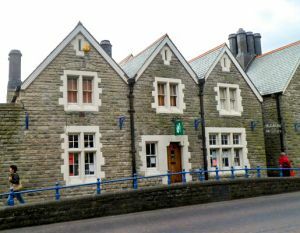 The Porthcawl Museum traces the history of Porthcawl and area and features a changing exhibition of local art as well as mementoes of WWII, old photographs, and Victoriana. The museum is housed in the Old Police Station, built in 1877 and home to local police force until 1974. The charge room used by the police now houses the local Tourist Information Centre. Collections cover the marine history and local heritage of Porthcawl, with a particular focus on military history, especially the 49th Recce Regiment, which was formed in Porthcawl in 1942. See objects related to the history of the DLPR and Great Western Railways, dating from 1825, and a collection of Victorian costumes and objects from everyday life. Learn about the history of the Welsh Guards, with uniforms, medals, regimental records, weapons, and regalia. The museum also covers the history of the 12th century parish church of St John the Baptist. The most recent additions to the museum collections are a pair of 18th century cannons revealed by storms at Rest Bay. The cannons are undergoing restoration and will be on display to visitors, along with coins from the reign of George II, buttons, lead shot, and a shoe buckle found beside the weapons.